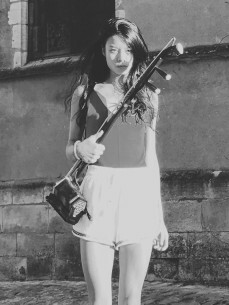 May, grew up in Chengdu, began to learn Chinese folk music instrument - Erhu when she was 9 years old. Inspired by her passion for electronic music, She started to explore the combination of traditional Chinese folk music with electronic music. Where a new unique Chinese element is beautifully blended in her sound-trucks, She tried out in Chengdu underground scenes first, and was discovered by many producers, which led to many invitations to perform in Shanghai, Xinjiang, Kunming, Suzhou, During this time, people from other cultures started to recognize this creative artist, She was then invited to perform in France(Château Perché Festival). May is constantly polishing her skills to express her peculiar interpretation of Erhu and electronic music. She founded the brand “Temple Rat” in 2016 and played Erhu lively, Since then she and her music became unstoppable in numerous music scenes. The combination of strong eastern 44 frequency, nature, ancient rhyme and industrial rhythm has formed a unprecedented “MAY style”.